The pathogenesis of tendinopathy and the primary biological change in the tendon that precipitates pathology have generated several pathoaetiological models in the literature. The continuum model of tendon pathology, proposed in 2009, synthesised clinical and laboratory-based research to guide treatment choices for the clinical presentations of tendinopathy. While the continuum has been cited extensively in the literature, its clinical utility has yet to be fully elucidated. The continuum model proposed a model for staging tendinopathy based on the changes and distribution of disorganisation within the tendon. However, classifying tendinopathy based on structure in what is primarily a pain condition has been challenged. The interplay between structure, pain and function is not yet fully understood, which has partly contributed to the complex clinical picture of tendinopathy. Here we revisit and assess the merit of the continuum model in the context of new evidence. We (1) summarise new evidence in tendinopathy research in the context of the continuum, (2) discuss tendon pain and the relevance of a model based on structure and (3) describe relevant clinical elements (pain, function and structure) to begin to build a better understanding of the condition. Our goal is that the continuum model may help guide targeted treatments and improved patient outcomes. What is the relevance of tendon structure and pathology in what is primarily a painful condition? What is the relationship between structure, pain and function? How should tendon pain be considered as part of the continuum? Is the response to load normal adaptation or a pathological process? How can the continuum guide clinical treatment? The complexity of normal tendon structure, the multifaceted nature and magnitude of the tendon’s response to injury, and the difficulty in creating an experimental model that mimics load-related tendon pathology in humans make it difficult to construct a simple and robust model that accommodates all aspects and phases of the condition. There are key arguments for and against all these models, as well as commonalities among models (http://tinyurl.com/zkzza9x). The collagen tearing hypothesis is the oldest and perhaps the most open to challenge because normal collagen fibres cannot tear in vivo without substantial alterations in the non-collagenous matrix.10 The longevity of normal tendon collagen suggests that collagen tearing and remodelling does not occur as a result of loading.11 ,12 Recent publications cite early changes more as fibre kinking and a ‘loosening’ of the collagenous matrix.13–15 As such, in vivo animal models of tendinopathy based on collagen disruption theory (collagenase injection, tendon laceration) have limited relevance to human tendinopathy. The role of inflammation in the tendon's response to overuse is complex.18 A classic inflammatory response in the tendon is seen when a tendon (and its blood supply) is ruptured or lacerated. The tissue response to such an insult is profound19—a large immune cell and tenocyte response increases protein production and tendon size. What is inflammation? Courtesy Dr James Gaida. The elevation in inflammatory cytokines observed in tendon pathology may reflect tendon cell signalling in response to mechanical stimuli resulting in an alteration in tendon synthesis and degradation.34 An imbalance between synthesis and degradation may lead to tendon disorganisation.11 ,35 While it may appear that the inflammatory models and the continuum of pathology are distinct, they may not be mutually exclusive. 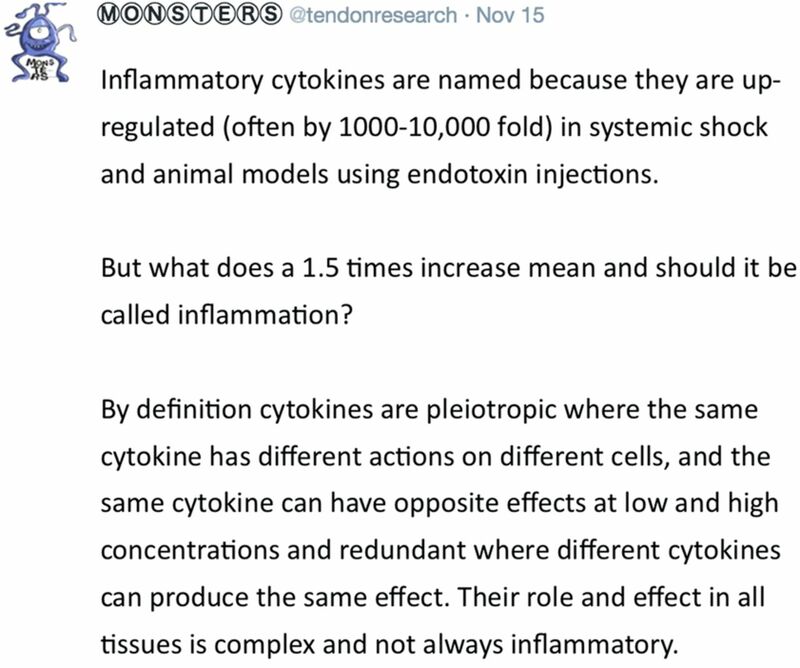 A tendon cell is mechanoresponsive, releasing cytokines in response to overload that then stimulate matrix remodelling (degradation and synthesis). The tenocyte is primarily responsible for maintaining the extracellular matrix in response to its environment. Thus, changes in tendon load and biochemical milieu will be sensed by the tendon cell and result in a cascade of responses (cell activation, proteoglycan expression and changes in collagen type).36 ,37 Similarly, a tendon cell-based response logically explains the tendon's adaptation to compressive loads that occurs in the development of fibrocartilage within wrap-around tendons,38 or with transient (direct blow)39 or chronic (entheseal pathology) overload.40 It is unclear how collagen disruption/tearing models of tendon pathology account for these features. While not represented in the schematic of the continuum model, the concept that ‘some tendons may have discrete regions that are in different stages at the one time’.1 In revisiting the continuum, we have emphasised the important clinical presentation that is a hybrid of reactive and degenerative pathology, which is ‘reactive-on-degenerative tendinopathy’ (figure 2). This refers to clinical cases where the structurally normal (to conventional imaging modalities at least) portion of the tendon may drift in and out of a reactive response (figure 2).45 As discussed above, the degenerative portions of the tendon appear mechanically silent and structurally unable to transmit tensile load, which may result in overload in the normal portion of the tendon.46 Better imaging modalities and prospective studies are needed to identify the structural factors (ie, amount of disorganisation, variability in structure over time) that are important in the development of pain. There are clear associations and dissociations between structure, pain and function, and a number of reviews have focused on this complex relationship in tendons.8 ,9 Tendon pain is partly related to function, with tendinopathy decreasing muscle strength and motor control, which in turn reduces function.47 ,48 Function in this context refers to the ability of the muscle to repeatedly generate appropriate force that enables the tendon to store and release energy for athletic movement. However, changes in function also occur in the presence of structural pathology, independent of pain. This highlights the complex interplay among structure, pain and function.49 ,50 The clinical presentation and quiescent changes in pain, structure and function can be linked as depicted in figure 3. Relationship between structure, function and pain. The relative sizes of the boxes may vary from tendon to tendon. Where does tendon pain fit in the continuum model? 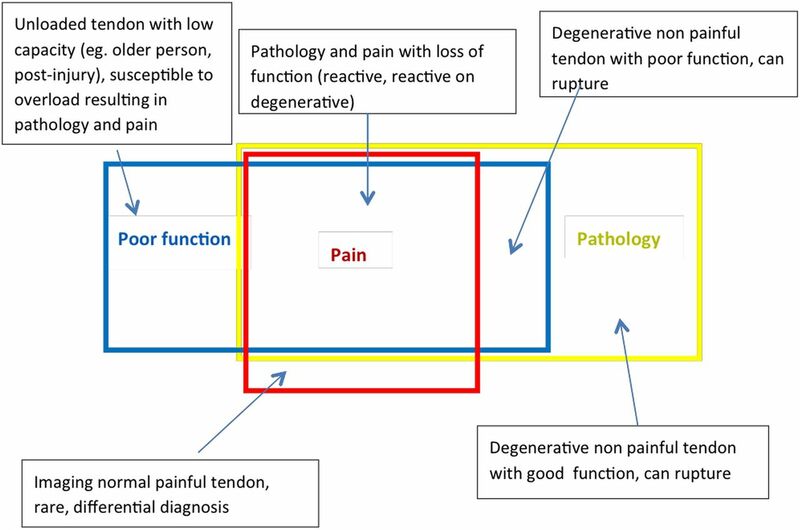 Clinically, tendon pain presentations fall into two categories in the continuum model: (1) reactive tendon with a first presentation of tendon pain following acute overload and (2) reactive-on-late dysrepair/degenerative tendon pathology (figure 4). This strongly suggests that reactive tendon pathology has a local nociceptive driver. Schematic representation of how we may phenotype patients with tendinopathy in relation to the continuum and target treatments. The aim of treatment is to push the tendon into the green section with relatively little pain and good function. Tendon structure can be normalised in the early stages of the continuum where rehabilitation can push the tendon ‘up the continuum’. In the latter stages of the continuum, ‘moving up the continuum’ may not be possible, so interventions should be focused in ‘moving the tendon sideways’. It is important to note that interventions directed solely at pain will not drive the tendon to a positive outcome as they do not address dysfunction, such as motor inhibition, strength and power deficits, or tendon load capacity. Interventions that target structure may improve tendon structure and direct the tendon ‘upwards along the continuum’; however, it will not address functional deficits (effect on pain is inconclusive) or load capacity and may leave the tendon vulnerable to reinjury. The identity of the nociceptive driver in tendinopathy remains elusive. The strong relationship between tendon pain and mechanical load, together with the mechanoresponsiveness of tenocytes and lack of sensory innervation of the deep tendon tissue, may implicate paracrine signalling by the tendon cells as a potential driver of nociception51 These substances may sensitise peripheral mechanoreceptors near or in the peritendon52 stimulating the peripheral nerve and be interpreted as pain. This may explain why pathology can occur deeper in tendons without tendon pain as this region is remote to the nerve supply. 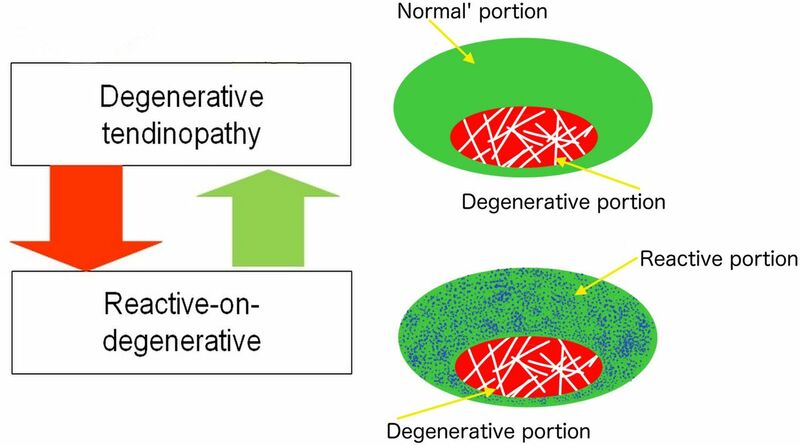 Theoretically, a painful reactive or reactive-on-degenerative tendon may increase expression of nociceptive substances and their receptors, stimulating the peripheral nerve and be interpreted as pain. Diffuse reactive pathology may also irritate the peritendon due to an increase in tendon size. The pain-free tendon may contain substantial matrix and cell abnormalities, but limited nociceptive substance production, signalling ability or receptor activation, which is in summary an insufficient nociceptive stimulus. The role of the central nervous system in the modulation of nociception and output of pain is acknowledged and well described by others;8 ,53 however, it is beyond the scope of this paper. Loading a painful tendon perpetuates nociceptive stimuli, and it is plausible that secondary hyperalgesia in tendinopathy is a response to ongoing nociception. Hyperalgesia by itself does not define tendinopathy as a pathophysiological pain state or centrally driven phenomenon.51 Several clinical features support this concept; tendon pain remains localised and temporally linked to tissue loading,54 with little evidence of spontaneous tendon pain (stimulus-independent pain) that is a feature of other pathophysiological pain states. Some consider tendinopathy to be centrally driven, while also questioning the relevance of local changes in tendon structure. While there is evidence of contralateral sensory perception changes in people with tendinopathy,55 this can equally reflect persistent nociceptive drive from the local tissue. Acute pain conditions, such as acute inversion ankle sprain, also caused secondary hyperalgesia;56 however, this can be reversed instantaneously with an anaesthetic. This suggests that the nociceptive input from the periphery maintains sensitisation.57 Unilateral isometric exercises in patellar tendinopathy have no effect on contralateral pain,58 suggesting that local factors or pathways are critical in pain production. In summary, we acknowledge that there is good evidence for adaptations (both motor and sensory) in tendinopathy, yet we cannot dismiss the role of local nociceptively driven pain. Is a response to load part of an adaptive or pathological process? We proposed that reactive pathology (as defined in the model) results in an increase in large proteoglycans but further consideration and recent studies suggest that there must be an earlier phase that is less intense and potentially transient. The Achilles tendon62 and superficial digital flexor tendon in the horse63 undergo a definite but subtle structural response on imaging 2 days after high loads that returned to normal by day 4. The time course of these changes in imaging appearance (ultrasound tissue characterisation (UTC) echopattern) is similar to that of the 2–3 days it takes to express and break down large proteoglycans such as aggrecan.64–67 A similar response is seen using MRI—this suggests an increase in large proteoglycans and associated bound water in response to high load exercise.68 It is unclear whether these changes are adaptive or pathological and whether they have a lasting effect on the health of the tendon (in reference to pain). The normal Achilles tendon improves in structure as seen using UTC69 over the course of an elite Australian football preseason; this supports the adaptive pathway suggested within the continuum.70 However, in this same cohort, 3 out of the 18 participants progressed to a reactive pathology, that is, structure deteriorated and pain developed. This highlights that the effect of load on tendon structure may vary depending on intrinsic risk factors (genetics, adiposity, age, etc) and other features within loading history.71 Load magnitude and recovery time, as well as numerous other factors (type and consistency of load stimulus), may influence tendon response and the progression along the continuum.35 Furthermore, it also highlights the difficulty in attempting to dichotomise the tendon's response as being pathological or adaptive, as these changes are likely to fall within a greater continuum. How would the practitioner choose a treatment based on the continuum? The continuum model suggested that management may be optimised by tailoring interventions to the stage of pathology and targeting the primary driver (cell activation) and inter-related alterations in matrix integrity. While exercise and load management are fundamental to management, a plethora of intratendinous and peritendinous interventions exist to ‘treat’ tendinopathy—this increases the complexity of the clinical decision-making process. Tendinopathy is a heterogeneous clinical presentation due to the variable change in matrix structure, pain and dysfunction.9 Phenotyping of patients based on structure, pain, dysfunction and load capacity may allow the clinician to direct appropriate treatments at the critical limiting factors (figure 4). Interestingly, isometric quadriceps muscle contractions in patellar tendinopathy induce immediate analgesia and reduce cortical inhibition of the muscle, which in turn improves strength.58 Intervening with a loading programme also has the advantage of benefiting the tendon,76 the muscle,77 as well as the cortical control of that muscle, which may lead to improvements in function and a positive clinical outcome. An incremental load-based rehabilitation programme is capable of modifying the balance of excitability and inhibition in muscle control,78 thus altering the loads transmitted by the tendon. There are few papers that investigate dysfunction in tendinopathy because pain and structure have been deemed to be more important. It is also difficult in the clinic to quantify function and the tendon's load capacity, where pure measures of strength may not reflect the whole picture (see separate paper on ‘Capacity’ in BJSM79). There can be alterations to the graded recruitment of muscles associated with tendinopathy leading to changes in function.58 Return to sport is potentially a measure of function and load capacity, though most research has been conducted outside of the competitive season. While addressing pain may remove a barrier for improving function, dysfunction including persistent deficits in muscle performance or the kinetic chain, as well as insufficient tendon load capacity, may well predispose the tendon to reinjury (figure 4). Further research is needed to better characterise the functional deficits associated with tendinopathy and develop useful tools for the clinician. The continuum model1 provided a framework to understand the potential of the tendon to regain normal structure. This particularly applies to the reactive stage (figure 4) of the model where it remains possible for the tendon to regain its normal structure with optimal management.16 Treatments that may dampen tendon cell response at this stage (unloading, medication directed at inhibiting the cell and resultant matrix changes) may also reduce pain, although this is yet to be substantiated. Notably, heavy load eccentric exercises or intratendinous injections may be highly provocative and deleterious within this reactive stage. Furthermore, the pathological tendon appears to effectively compensate for areas of disorganisation by increasing in cross-sectional dimension to maintain sufficient volumes of aligned fibrillar structure.80 Since the degenerative tendon has sufficient levels of load-bearing tissue, and given the limited ability of the tendon to reverse the pathology, treatment strategies should be directed at optimising adaptation of the tendon as a whole (figure 4). Specifically, treatment at this stage should aim to build load capacity in the aligned fibrillar matrix portion of the tendon rather than attempting to stimulate healing in the degenerative portion. While the continuum classifies tendons based on the extent/presence of structural disorganisation, targeting treatments at regenerating the area of disorganisation may be futile as the tendon may have already compensated, or be in the process of doing so. This conceptual shift may be explained by the metaphor, treat the doughnut (area of aligned fibrillar structure), not the hole (area of disorganisation). However, sufficient aligned tissue of itself will not protect from further episodes of reactive pathology; to achieve this, management must progress to improving the load capacity of the ‘doughnut’ through a progressive loading rehabilitation. In this context, it is difficult to find relevance for treatments directed at repairing tendons and normalising structure through the addition of growth stimulants (eg, platelet-rich plasma),81 which do not appear appropriate for the pathological process at any of the continuum stages. It should also be recognised that there is a hyperactive tendon cell response, as well as an increase in tendon cell numbers, in all stages of tendinopathy, even in the degenerative stage.64 The addition of additional cells (stem or tenocytes) into a hypercellular environment would appear counter-intuitive, as the ability to recreate a viable cell–matrix relationship is limited in a frankly degenerative region of the tendon that is unable to transmit tension. Regardless of the initiating event (overstimulation of resident tenocyte, collagen disruption/tearing, inflammation), tendon pathology is characterised by a significant cell response to injury.7 ,82 It is unlikely that any one model fully explains all aspects of the pathoaetiology of tendon pathology and its links to pain and function, as these processes and relationships are complex. Equivocal clinical intervention outcomes from research that may well be due to heterogeneity in the research cohorts. Subgrouping by tendon pathology for clinical trials may give clearer outcomes and better clinical guidance. The capacity to test the continuum in humans is limited in part by the capacity of present imaging modalities to detect pathological and structural changes, along with the need for a deeper understanding and greater precision in the measurement of the various aspects of pain and associated dysfunction in tendinopathy. The requirement to better comprehend these inter-relationships in time should guide effective management through considered interventions across the spectrum of presentations. The history of biomedical research would remind us that this paper, as with many of our colleagues, are just a part of the very long and complex journey in the better understanding of this challenging condition.
. Cell-matrix response in tendon injury. Clin Sports Med 1992;11:533–78.
. The interface of mechanical loading and biological variables as they pertain to the development of tendinosis. J Musculoskelet Neuronal Interact 2011;11:94–105.
. Achilles tendon structure improves on UTC imaging over a 5-month pre-season in elite Australian football players. Scand J Med Sci Sports 2015.
. Pathological tendons maintain sufficient aligned fibrillar structure on ultrasound tissue characterization (UTC). Scand J Med Sci Sports 2015.